Canada wildfires still not contained. Do you have a plan that includes your animals? Here's a first hand account of dog owners who fled the Los Alamos fires. The residents of Los Alamos New Mexico have survived two large forest fires in eleven years, both requiring complete evacuation of nearby towns. Many of us have pets, dogs, cats, horses, etc. that also have to be evacuated. The town sits on a plateau at an elevation of 7,300 feet with two roads into town. In 2000 a fire that started as a controlled burn became a raging inferno. 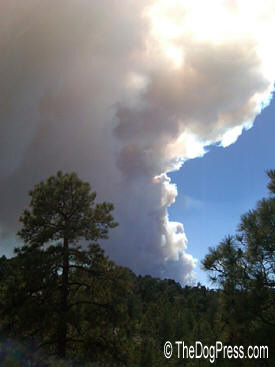 The entire population of Los Alamos, around 12,000 people, had to evacuate. That night 400 people lost their homes but ours was spared. It was very traumatic as we sat in our son’s house in Santa Fe with our 3 dogs and watched houses burning, propane tanks exploding. 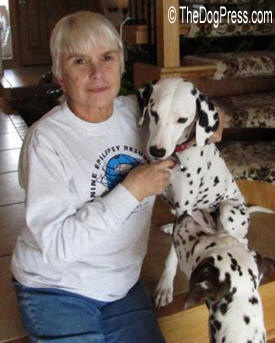 The one day we were allowed back to check on our homes our Dalmatian had epileptic seizures because of the contaminants in the air. Some parts of the Los Alamos National Laboratory had burned but the problem was mostly the unhealthy air because of the smoke. Then on Sunday June 26th, 2011 our son phoned. “Mum look out your window, there is a huge fire burning near you.” I did and to my horror, I saw a huge plume of smoke towering right behind us. I turned on the TV to hear that a voluntary evacuation was taking place. We decided to try and stick it out but the next day I started to get nervous. The wind was beginning to blow hard from the SW as it had in the 2000 fire, the plume was spreading and then began to irritate my lungs. We decided to evacuate and stay in our RV at a Santa FE Campground. First we made sure we had our Will and other papers, then we packed a few clothes, thinking that we would be back in a few days. We feed raw and packed frozen dog food in a cooler. As we were packing the last items, they announced mandatory evacuation. Knowing that dogs and other animals can sense distress it was important to act as if we were just going camping. I could see that our two Dalmatians, Will and Lyra, were a little nervous but as soon as they saw me put their box of toys in the truck and I said “we are going camping” they seemed to relax. My husband took the dogs in the RV and I drove my car because last time so many cars were reduced to ashes. For me, the ride off the high plateau and down to Santa Fe was traumatic. We were ahead of most people but I was shaking inside because the fire seemed to be growing at an unreal pace. I kept looking out of the window at the mountains to see where the fire was but there was so much smoke I couldn’t tell anything. Once again, the evacuation was very orderly, perhaps because a large percent of the residents are scientists and we have all been through this before. A few people went to the evacuation center in Espanola but most went to hotels or family. People in the evacuation centers were very stressed because they were told “no pets “ but in the end the people running the shelters brought in crates and that diffused much of the anxiety. All the fancy hotels cut their prices way down and allowed the dogs and cats to stay with their owners as they had done in 2000. When something like this happens, everyone pulls together, it’s amazing. Santa Feans who had a spare bedroom were offering to take in people. Many pets, including chickens and rabbits, ended up in the various kennels and animal shelters and horses were trucked to an equestrian center in Santa Fe. There were a huge number of firemen, helicopters, water tankers, FEMA, and other organizations in town. Helicopters were buzzing overhead taking huge buckets of water up into the mountains. National news expressed valid concerns that the fire would reach the nuclear research laboratory which had been closed but still housed plutonium and other weapons research elements. The fire grew bigger and bigger. We could see it from our campground. Each day another 10,000 acres burned as the wind howled and the air sizzled. Bandelier National Monument was badly affected with 2/3 of the magnificent forest burned. Our dogs are used to running every day so we found a large dog park in Santa Fe that allowed them to run at top speed and have fun with other dogs. It helped them to de-stress. On Monday July 6th the evacuation was over and most people went home, but those of us with asthma and other lung problems were told to stay put. We went back to Los Alamos on Thursday but we had to leave ASAP as the smoke was still thick and the air quality was deemed very unhealthy. So left for Colorado the next day in our RV and had several days of smoke free bliss which helped as animals also can suffer from smoke inhalation. 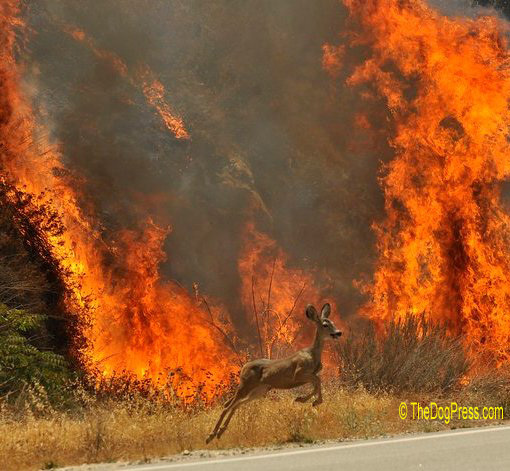 Sadly, untold numbers of bears, deer, elk and small mammals perished in the fire which had grown to almost 150,000 acres, the largest fire ever in New Mexico. Bears came into town trying to find food, one was so badly burnt he had to be euthanized. We returned on Monday July 13th when the air quality was classified as moderate. The mountains which had just begun to really look good after the 2000 fire are back to being all black again. We always have taken the dogs into the mountain canyons to run off leash. We will now have to wait two years or more because of the danger of burned trees falling as happened in 2000. We wait for the annual monsoons to arrive but they also bring with them the danger of flashfloods and erosion on a devastated landscape. In closing I would like to say that the main thing when evacuating from a fire, flood, any kind of disaster, is keep a level head and that is easier if you make plans before anything happens. You will know what you want to take with you in the event your house burns. 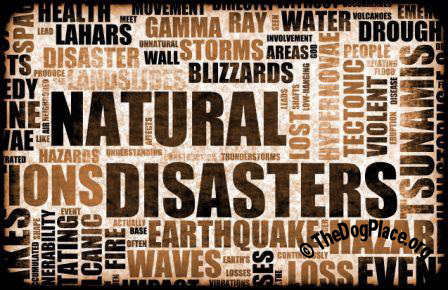 Don’t let your dogs see you panic, they can sense when an owner is stressing and it is then passed on to them . Try and keep life as normal as possible. For us it was easy having the RV as the dogs are used to being in it. 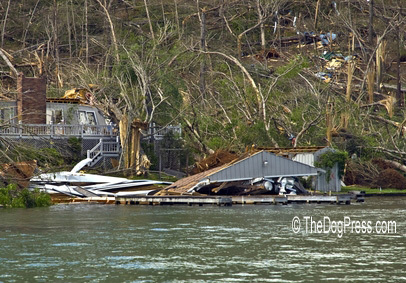 But it was still a nightmare and we are thankful we survived along with our home and our dogs. No one expects to have to evacuate but being prepared and keeping a cool head makes it easier, especially for your animals. Assemble hard-to-find but critical essentials, be prepared. 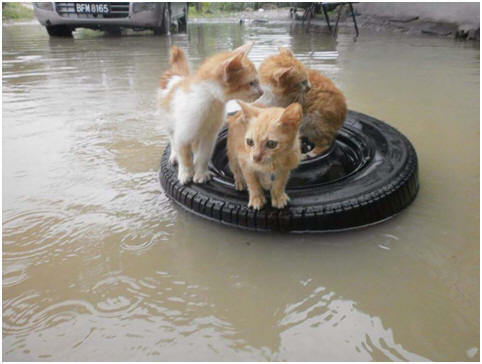 Weather or social disasters, will your shelter take your animals? Updated survival info if you have pets or elderly family members.